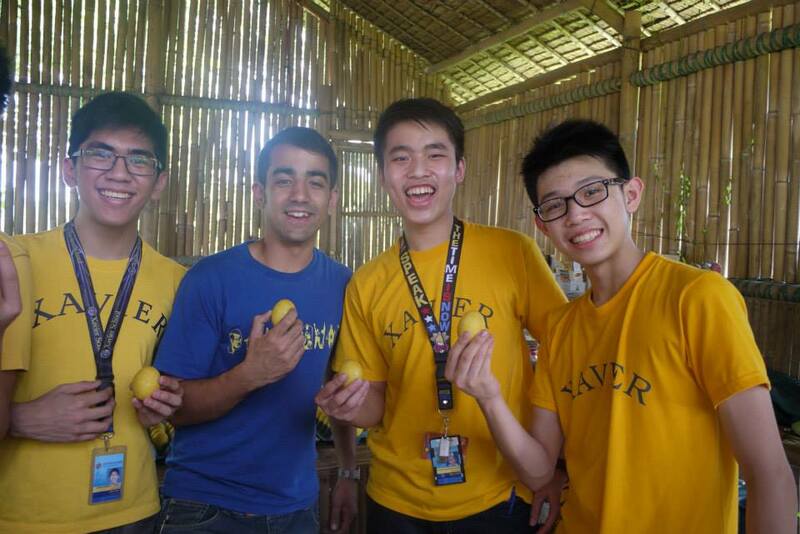 Gawad Kalinga Enchanted Farm – Starting Them Young – DUCK DELIGHTS! 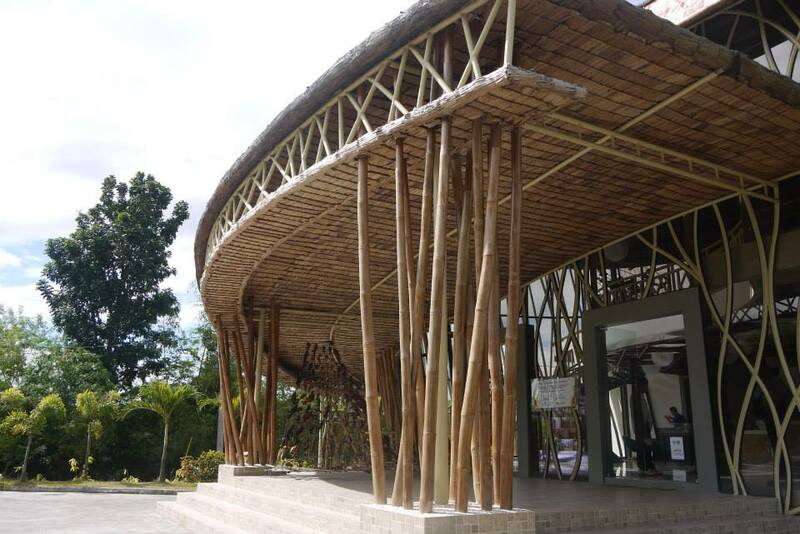 As you step into Gawad Kalinga (GK) Enchanted Farm you will be blown away for you can’t help but feel amazed as you see the vast farmlands with unique built centers of entrepreneurship in between. This awe-inspired feeling was the feeling Xavier students felt as we walked into the Hyundai Center for Green Innovation, a social entrepreneurship center made with bamboo for natural cooling and glass to maximize the sunlight, a powerful example in itself of what the Enchanted Farm is all about, sustainable innovation. The Hyundai Center for Green Innovation! Just from the area itself, you can see that there is so much potential for growth and development. And once you hear the social entrepreneurs speak, you suddenly realize that this potential growth isn’t just potential, it is a possible reality. With a mission to not only educate villagers but to also enable them to start their own social enterprises, Gawad Kalinga (GK) has become a hub for social entrepreneurs. A lot of people think that it’s just about creating new products and starting your own business, but social entrepreneurship is a lot more than just that. Through the several talks, we learned about the importance of sustainability, innovation, creativity, passion, hard work and perseverance. 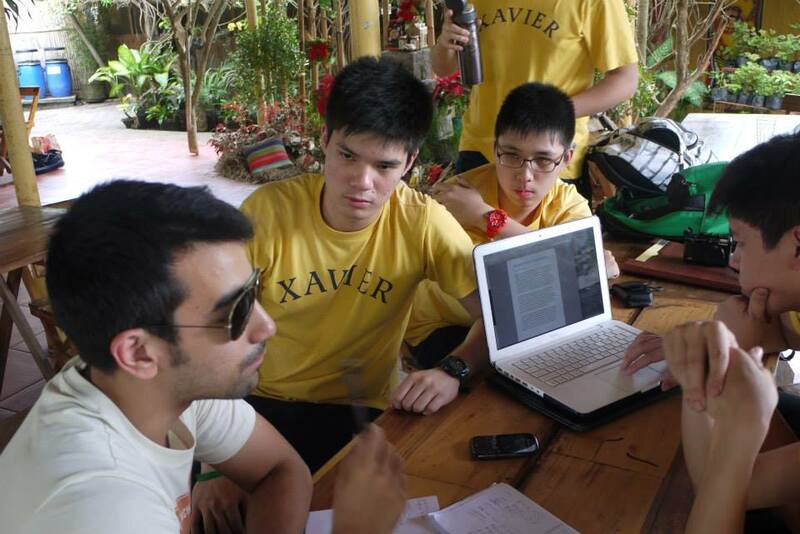 In line with this mindset, Xavier students got to partner with a social enterprise and social entrepreneurs and were tasked to come up with their own product. 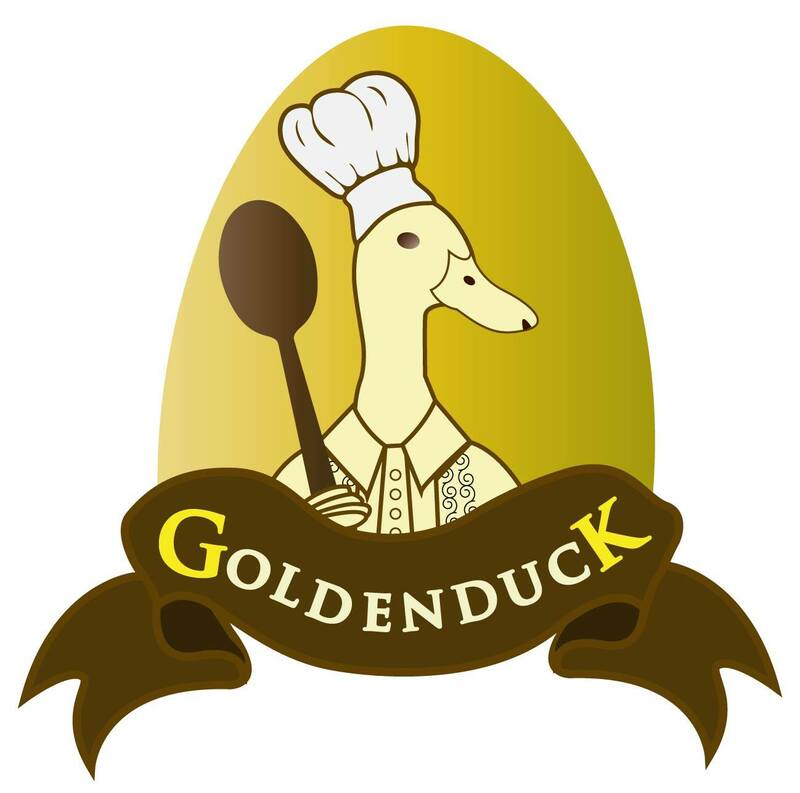 My group chose to partner with the social enterprise, Goldenduck. Just from the name itself, we were already very excited to see what it was all about because of the fact that it’s not everyday that you get to eat ducks especially here in the Philippines. We weren’t disappointed as we got to meet 21 year old Alvie Benitez, the founder of Goldenduck. It was the invitation of GK founder Tony Meloto to start a duck business and help raise the duck industry in the Philippines that pushed Alvie to drop out of college and enter the world of social entrepreneurship. Admittedly, Alvie has faced many challenges and committed several mistakes along the way. For instance, he can’t forget the time he bought his first set of ducks only to find out that half of the ducks he bought were already old and would have a hard time producing eggs. Yet, despite these challenges, Alvie remains positive, as Goldenduck makes small but powerful strides through its first two products, the Golden Egg, which was featured in KrisTV and the mouth-watering Duck Burger which has received strong feedback and has been selling out real quickly. With the founder of Golden Ducks, Alvie Benitez! After several hours of brainstorming, surveying, testing out different recipes and discussing ideas and possibilities, our group decided to innovate upon the duck and create a novel product, Authentic Peking Duck Wraps. We wanted to change the mentality that duck should only be eaten in big Chinese restaurants during special occasions. We also saw the market for a quick delectable snack as snack wraps have been gaining popularity. By combining thinly-sliced Peking duck meat with sautéed onions, leeks, lettuce, all muffed into a soft tortilla wrap with flavored rice to fill you up, topped with your own choice of dressing, either zesty sauce or hoisin sauce, you get a complete meal that oozes out with flavor in every single bite you take. Just the fact that our wrap has duck is more than enough reason for you to want to taste it. Proud of what our group has come up with, Duck Delights! With one whole month dedicated to learning how to run our own social business, we have gone through a boot camp that will reach its climax this coming weekend. From coming up with our 50-page proposal to calculating the weight of every single ingredient to defending our product to a panel of businessmen, it has been quite an adventure indeed. 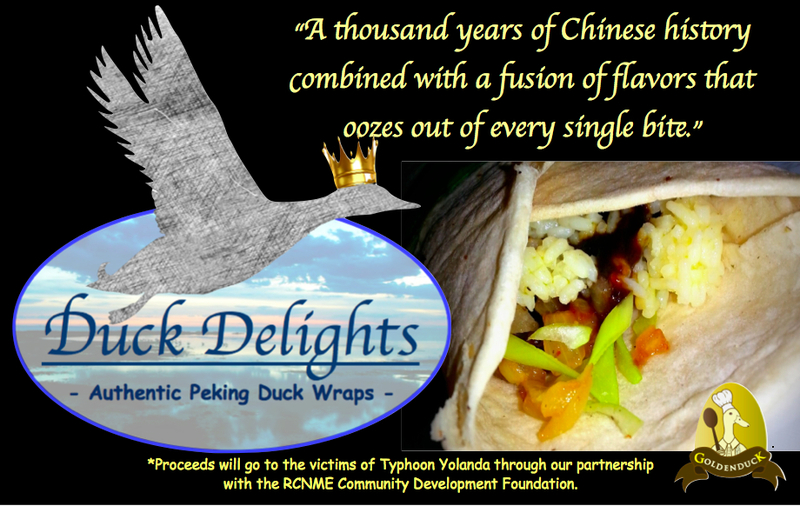 If you want to taste a thousand years of Chinese history with a mix of Filipino culture, support and visit Duck Delights at the Bright Lights Bazaar at Eton Centris, Quezon Ave. from December 14-15, 2013 from 10 am to 8 pm. It’s not everyday that you’ll get to quack, quack, quack in duck-ful delight! 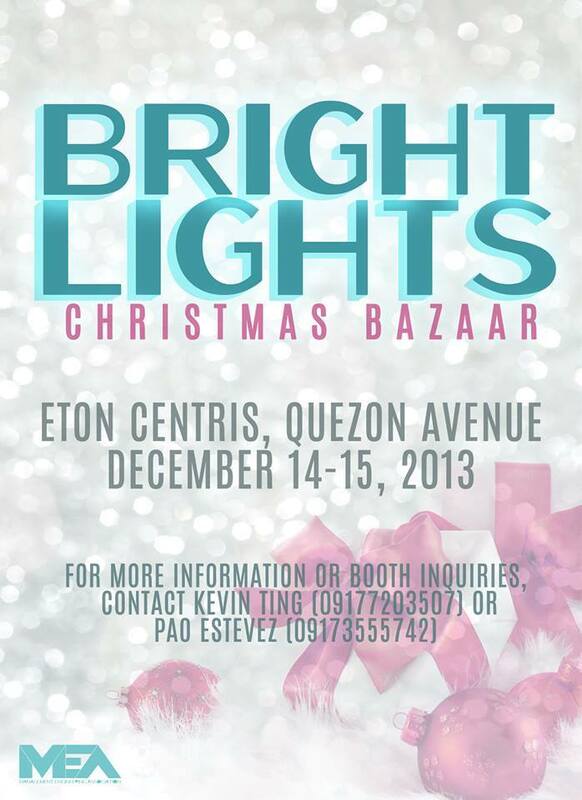 Come and visit the Bright Lights Bazaar at Eton Centris Quezon Ave. this weekend! This entry was posted in Business, Inspirational, Passion, School, Senior Year, Special Occasions and tagged Alvie Benitez, business, chinese cuisine, duck burger, Duck delights, economics, enchanted farm, entrep, entrepreneurship, Eton Centris, experience, gawad kalinga, GK enchanted farm, golden ducks, golden eggs, KrisTV, peking duck, schoole, senior year, social studies, Tony Meloto, workers, wraps, Xavier School, Xavier students on December 13, 2013 by David Ongchoco. Business while Doing Good: Social Entrepreneurship in Washington, D.C. Through thick and thin, through joy and sorrow, FRIENDS! How a City of Bones and a Dystopian World Can Teach Us The Value of Choices and Trust! Blessings in Disguise - When One Door Closes, Another Opens! My Hero, My Idol, My Friend, My Daddy - Happy Birthday and Happy Father's Day Papa!